Holy One. May we listen to You. And by listening, may we love. Amen. At the Baptist Theological Seminary at Richmond, one of the requirements for graduation is a Mission Immersion Experience. You are required to spend at least two weeks in a different culture. During that two weeks, you spend a lot of time becoming immersed into the culture and learning about the people on a deeper level. This trip is much different than typical mission trips. Instead of going with the intention of doing and serving and helping and taking “Jesus” to a foreign land, the purpose is to go and learn and perhaps even to discover how Jesus is already present. So, imagine this…2002 a young, single, female, naïve seminarian travels with a group of classmates to Cuba. In 2002 George W. Bush was president of USA and Fidel Castro was still leader of Cuba. While there were no impending threats against one another at the time, the relationship was still full of tension. Our image of freedom for the Cuban people was different than the image of freedom held by the Cuban government and that very fact held a lot of tension – not just with the US, but around the world. It is true that the people of Cuba were not treated fairly or justly by their own government. It is also true that the tactics of other nations to get the Cuban government to change were not fair or acts of justice either. There were strict travel bans to Cuba. The only way to get to Cuba was family connections or special Visas granted to particular organizations. We were able to secure our Visas through one of those organizations…the Alliance of Baptists. So, you can imagine the uneasiness of my family when I shared with them my intentions to visit Cuba. When we got to Cuba, which was not easy because there were no direct flights from the US (bouncing from Richmond to Miami to Bahamas to Cuba), we spent several days traveling and resting. We had a Cuban guide, Rita, who was a lovely woman that showed us around during our two weeks and a translator, Clem, a young father who had just finished his schooling and was preparing for his government appointed position. As we stepped off the plan in Cuba, we felt like we had stepped back in time. The roads were full of cars from the 1950s. And most of them were parked because of the outrageous gas prices. We spent our trip touring cigar factories and considering workers’ conditions; visiting medical facilities and observing the condition of healthcare; worshiping with natives and watching their purest praises, visiting government run newspapers and discovering that they had a freedom of speech set up by their government that was much different that our own. I quickly got over my dislike of beans because we were served rice and black beans for every meal…because that is what the rations provided for. We spent hours watching Cuban films and visiting schools. We spent hours dancing and trying to salsa, but our American hips just wouldn’t move! We learned how each student was provided a college education by the government and then as payment for their education they were appointed to government position based on their education for two years. For example, our translator Clem had spent his education learning the English language and was preparing to be posted at the airport as a translator. We learned how several generations of families lived together…the new generation upstairs, the first generation downstairs. We spent hours listening to young people and asking questions about their life in Cuba. I remember one of my classmates asking a Cuban young man where he like to go for vacation. He giggled a little and said, “the beach”. That was humorous to them because Cuba is surrounded by beach. He went on to explain that our understanding of vacation was only a dream for them. They had no way to leave their island. By the end of two weeks, we had listened a lot to the people of Cuba. We didn’t spend this trip working in the same sense that you may think of when you take a mission trip. On the contrary, our work was listening!! And by the end our trip we had some vulnerable conversations with some of the young people we visited with. And that’s what we did. We came back to the United States and wrote letters to our representatives sharing with them all that we had experienced in Cuba. By the end of the trip, the people of Cuba we had gotten to know began to trust us with their vulnerabilities. And that is because we came to listen. We did not have an agenda. We were there to be God’s love and we did so through the act of listening. In order to know what is just in a person-to-person encounter, love listens. It is its first task to listen. No human relation, especially no intimate one, is possible without mutual listening. Reproaches, reactions, defenses may be justified in terms of proportional justice. But perhaps they would prove to be unjust if there were more mutual listening. All things and all men, so to speak, call on us with small or loud voices. They want us to listen, they want us to understand their intrinsic claims, their justice of being. They want justice from us. But we can give it to them only through the love which listens. How do we offer God’s love for all? Friends, I want to suggest as Tillich does, that showing love begins by listening. After all, God listens. Take our Old Testament lesson today, Genesis 21. God had listened to the prayers and cries of Sarah and sent her a son Isaac. Isaac was blessed and was to be the father of the nations. And then there was Ishmael. Also, son of Abraham. Sarah insisted that Hagar and Ishmael be sent away. Abraham wasn’t happy about this because Ishmael was his son as well. It seems that Hagar and Ishmael are victims of jealousy and a human-plan, not a divine plan, as suggested by theologian Walter Brugemann. Meaning, Sarah and Abraham were trying to fix the problem that they weren’t able to have children by asking Hagar to have a child with Abraham. God’s plan was that Sarah was to bear Abraham a child…just not in their timing. God listened to the cries of Abraham and encouraged him to do as Sarah had requested. The Lord assured Abraham that Ishmael would also be cared for. Abraham sent Hagar and Ishmael away into the wilderness with bread and water. Now, we know from other contexts in the Bible how unsettling this is. Here is Hagar, an unwed mother and servant without family and without home sent out to make a way for her child alone. Nearly impossible for a woman in this time. And we have heard about other wilderness journeys to know the threats, dangers, and obstacles that await. So it is not surprising that Hagar and Ishmael run out of water. And because she cannot stand to see her child wail to death she places him under a bush and goes away from him to weep. And God listened! God heard the voice of Ishmael and sent and angel to Hagar encouraging her to continue on. It is no coincidence that the name Yish-may-el in Hebrew translates to “God will listen”. God’s all-encompassing love and compassion that covers human plans and human sins is shown to us through the power of listening! When Jason and I lived in the inner-city of Charlotte, we had folks in need knocking on our doors at all hours of the night and day. We never knew who was on the other side of the door or what their visit may be about. Often we were visited with folks who had lost their home or couldn’t pay their bills. Sometimes they had been kicked out by a family member or their children had been taken from them. They would come to us for help, and they would start sharing their story. I remember one day in particular. I can’t remember the exact neighbor or exact circumstance that brought her and her children to our door. But as she sat down and began to share her story, I can remember becoming overwhelmed by her needs. She had no home, no food for her children, no way to get to work, no one to care for her children while she worked and the list of problems got bigger and bigger. What was I going to do? How was I going to help? What could I do for her? The questions kept coming to me. But as I sat there and listened…without offering any answers, only being a place of support, I noticed that she began to talk herself into a circle and figure out exactly what she needed to do for herself. She realized she needed to go to a family member that she hadn’t called yet and start there. Because I was able to sit and listen for an hour or more, she had the opportunity to talk through some issues she was dealing with and find the best possible answers within herself. How often do we as a church listen as God listens? Just a few weeks ago Jason and I met with some friends from seminary that had moved to this area. They found a church home they were so excited to be a part of and then recently left because no one was listening to their needs. No one heard they were alone. No one heard they were overwhelmed with the addition of their fourth child. No one listened to their cries of stress. Friends, this story is so familiar. I weep when I hear another story of someone that been cast out of a church…either by force of the church system or by their own choice. Jason and I share stories almost weekly with each other where we have encountered another couple or individual who hasn’t felt heard by the church. Hagar was cast out by Abraham and Sarah from her home and the only thing that comforted her and gave her strength to carry on was that someone listened…God listened. Do you feel someone is listening to you? By being a part of this church, do you feel like you are in a place that will listen to you when you need us to? Take time to consider…this week many of you have shown love by listening to family that is grieving. You listened when there was a need to talk, a need for food, a need for childcare, a need for a friend. Many of you have taken time to show love by calling or visiting a shut-in and offering your gift of listening. Many of you have welcomed new faces into these doors by listening to their journeys. My prayer is that we can be a place that listens. And I challenge us to listen in new ways. Whether someone walks in these doors with a need, a celebration, or feeling broken, I pray we will first listen. That when someone walks through our doors, whether they are new or have been member for 80 years, that we will listen. I pray that we will offer compassion as God does through the simple act of listening. For the people of Cuba, it meant hope to be heard. For Hagar, it meant life for her and her son because God listened. For the church, it can mean a community of life and a place of grace. 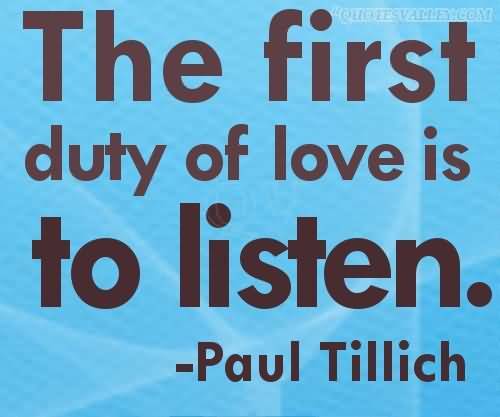 As Tillich suggests, we can practice justice and offer love through the art of listening. Because Love listens. Amen.